If Warwickshire go on to miss out on the championship by a handful of points, they will surely rue the final day of this match. They dropped five chances on the day, none of them especially difficult, to allow the visitors to escape from a position of some peril. On such a slow pitch, such profligacy was fatal. "It's disappointing," Warwickshire's director of cricket, Ashley Giles, admitted. "We got ourselves in a great position to win the game and we can only blame ourselves for not doing so. We just didn't quite seize the moment. "But I'm very happy with the way we batted and the way our young seamers bowled. Everything I read before the season suggested we are complete underdogs, so to have outplayed Hampshire for most of this game is pleasing. All our cricket was good except our catching." The result was not purely the product of Warwickshire's wastefulness, however. 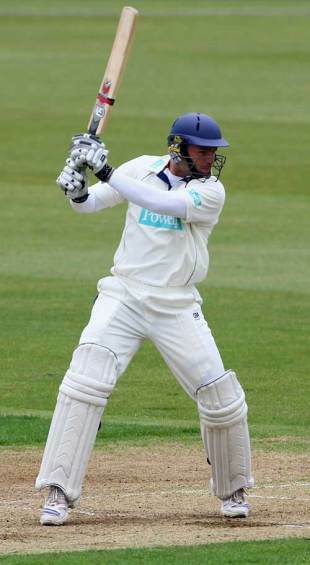 Hampshire were also grateful for the input of a trio of half-century makers, not least the substitute Michael Lumb. Lumb had hardly been in the best of form. After a pair in the first championship game of the season, against Worcestershire, he suffered another duck in the second eleven match from which he was withdrawn to replace Marcus North. Here, however, he batted very well. Driving sweetly, he looked quite untroubled until an attempted pull ballooned off the back of the bat and onto the stumps. It was the impact of another substitute that proved crucial, however. Navdeep Poonia, a fielder more in the Monty than Jonty mould, was only on the pitch a few minutes, but managed to drop Nic Pothas at short mid-off before he had scored. The furious reaction of the bowler, Ant Botha, spoke volumes. Botha deserved better. He delivered 39 overs on the final day, probing at the batsmen with some gentle turn and subtle variations and fully deserving his four wickets. Three of the dropped chances came off his bowling. Pothas was reprieved again on 25. This time Jonathan Trott, at first slip, was the guilty man, as he failed to hold onto a low chance in Darren Maddy's first over. Pothas went on to record another half-century and make the game safe. Hampshire's approach to much of the day was puzzling. Some of their batting was more suited to an IPL run chase than an attempt to save the game. Jimmy Adams fell to a catch on the mid-wicket boundary while Sean Ervine, who was dropped first ball and then, horribly, on just four by Tony Frost at mid-on, edged an airy drive. John Crawley paid the penalty for only coming half forward to one that turned and took his outside edge, while Michael Carberry's worthy game ended when he edged an arm ball to slip. When Lumb and Dawson, who missed a full toss, fell in quick succession, Warwickshire scented victory once more. Pothas finally found a good ally in Dominic Cork, however, and the pair played out the final hour without further alarm. Warwickshire took some consolation from extending the longest unbeaten run in the land. They have not lost since Giles took charge at the start of 2007 - a period of 18 championship games - though they have only won twice at Edgbaston since the start of 2006. The addition of Jeetan Patel, who arrives within the next few days, will be most welcome. As an England selector Giles also had encouraging words for Hampshire seamer Chris Tremlett, who produced a blistering spell of fast bowling on the second day. "I wouldn't have wanted to be facing him," Giles said. "He has massive potential and it was nasty for a couple of overs. If he was more consistent with those sort of spells, then that's Test bowling. There aren't too many fast bowlers out there. But there's no point just doing it for three or four overs; he needs to string performances together."